WHICH LIBRARIES DO YOU WANT TO EXPLORE TODAY? 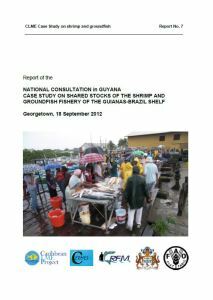 This is the report of the national consultation organized by the Ministry of Agriculture of Guyana, in collaboration with FAO and the Caribbean Regional Fisheries Mechanism (CRFM), held in Georgetown, Guyana, on 18 September 2012. The report contains a summary of the discussions held during the national consultation, the results of a scoping exercise that was carried out by the participants, the baseline report that was discussed and agreed upon by the stakeholders, as well as the results of the preliminary meetings that were held prior to the national consultation. 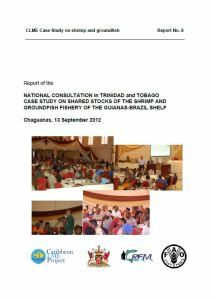 This is the report of the national consultation organized by the Fisheries Division of the Ministry of Food Production of Trinidad and Tobago, in collaboration with FAO and the Caribbean Regional Fisheries Mechanism (CRFM), held in Chaguanas, Trinidad on 12 September 2012. The report contains a summary of the discussions held during the national consultation, the results of a scoping exercise that was carried out by the participants, as well as the baseline report that was discussed and agreed upon by the stakeholders. Abstract: Case Study On Shared Stocks Of The Shrimp And Groundfish Fishery Of The Guianas-Brazil Shelf. Regional training workshop on facilitation, Port of Spain, 11-15 July 2011. 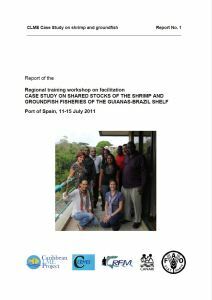 The training workshop was led by the Caribbean Natural Resources Institute (CANARI); it was attended by representatives from Brazil, Guyana, Suriname, Trinidad and Tobago, FAO, the Caribbean Regional Fisheries Mechanism (CRFM) and the Centre for Resource Management and Environmental Studies (CERMES). The workshop was designed to be participatory and interactive and to maximize opportunities for peer learning. 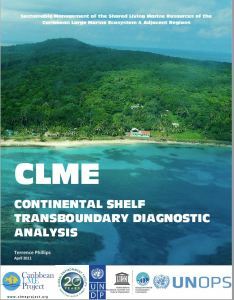 Abstract: This report addresses the governance aspects of udpating the Transboundary Diagnostic Analysis for the CLME Project. 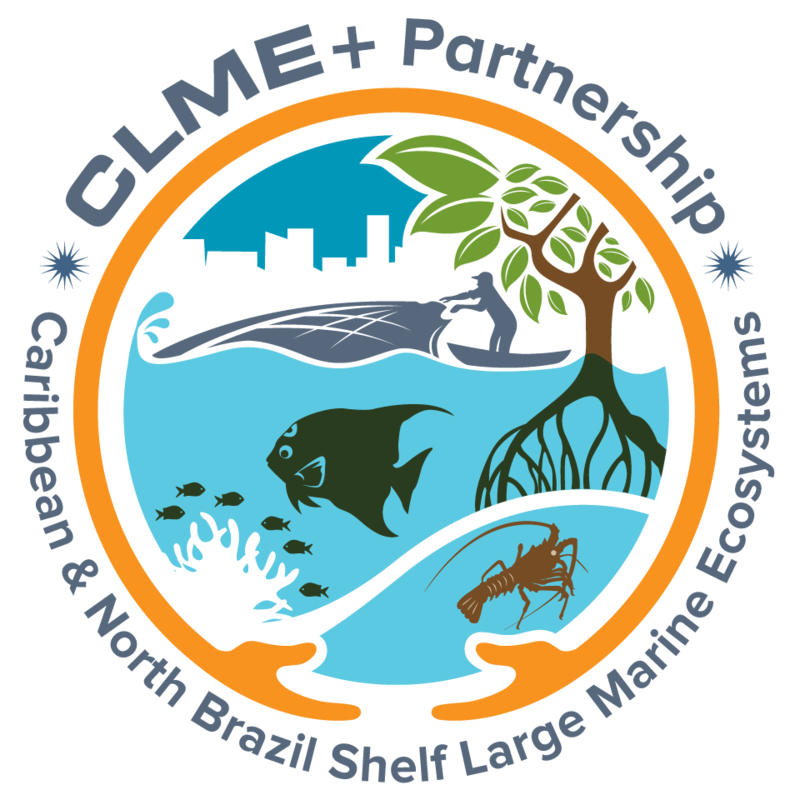 The importance of having an effective governance regime in place to address the sustainability of the living marine resources of the WCR was identified during the project development phase of the CLME Project as the principal driver underpinning the actions to be taken in the full Project. It provides an overview of the governance issues identified in the preliminary TDA, then reviews the Large Marine Ecosystems Governance Framework that was developed for and adopted by the project as a basis for the project design. Next the report reviews advances in ocean governance thinking globally and regionally that should assist the project to move forward. Finally, the report considers how the original governance perspective, as well as the subsequent advances in ocean governance, can be incorporated into the new orientation towards a fishery ecosystem-based approach to provide the most comprehensive and up-to-date approach to governance for the CLME Project.